The Housewife Diaries: It's Friday! I'm a happy, relieved girl today. It's been a crazy week at my house. Nothing in particular to report - just one of those kids/work/emotions kinds of weeks. Are you familiar with that kind of week? I'm relieved the hard part is over and we're onto the fun part! The hubs and I have The Red Ball to attend this weekend. (happy dance!) 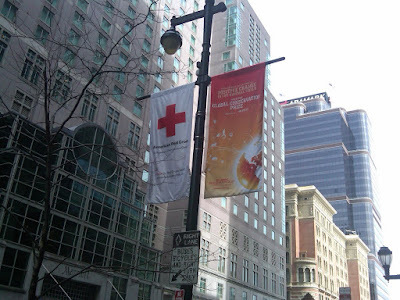 Did you know it's Red Cross month? This whole month, various Philadelphia city landmarks will be lit up in red in honor. The Cira Centre and Ben Franklin Bridge are among the landmarks scheduled to be lit in red, and other buildings will also be lit up on a day to day basis. It should look amazing! I'm hoping to get some pictures while we're in Center City this weekend. Here's a picture the hubby took yesterday afternoon on Market Street. Notice the flags! Stay tuned for a full review of The Red Ball. I'm hoping to get lots of pictures - the best part is I'll be hanging out in the VIP area with all the other press and special people. Should make for an exciting night. Hopefully I don't pee my pants from all that yummy food! To send you off, here's one of my new favorite "it's Friday!" songs. I hate the band Train. Yuck. However, I LOVE this song. It's happy, fun to dance to, and the mandolin makes it sound kind of beachy. Damn, how I wish I was on the beach right now! Amen! TGIF! What I really wanna know is how is it that you've lived in Philly for like two minutes and have a life? I still can't find mine and frankly it's getting old. Who ever said that the south was a fun friendly place to be is on meds. Have fun at the ball and can't wait to hear all about it! Aww, I miss you!! I hate Train too (obviously, you are my music twin after all) but this song rocks. Have a blast at the ball, can't wait for photos.